Of course, unless you're an athlete, it's a major turn off if you're experiencing excessive armpit sweating. It can really hinder you from being more confident about yourself. A lot of brands offer antiperspirant deos and products, and whether they're effective or not, I'm pretty sure they leave you with another problem: stains. Ack! Your regular deodorant can cause two types of stains on clothing: the white marks (on your dark clothes) and yellowish stains in the underarm area. Some people get frustrated from trying to remove the stains with laundry detergents 'cause at times, even after several washes, they're still visible. Dyahe na tuloy to wear the garment again! Thank goodness, NIVEA finally formulated a new generation of deodorants that leave no white marks on dark fabrics plus minimize yellow stains on light-colored clothes along with the help of textile experts at the Hohenstein Institute! The result of the successful search is a textile protection technology, a sensational innovation that can be found in the new deos from NIVEA Deodorant Invisible for Black and White. With the new technology, the substances that cause staining cannot adhere so effectively to the fibers, so they're easier to remove during washing! With the new NIVEA Deodorant Invisible for Black & White, you're sure that black stays black and white stays white for longer! Your favorite clothes will look their best! 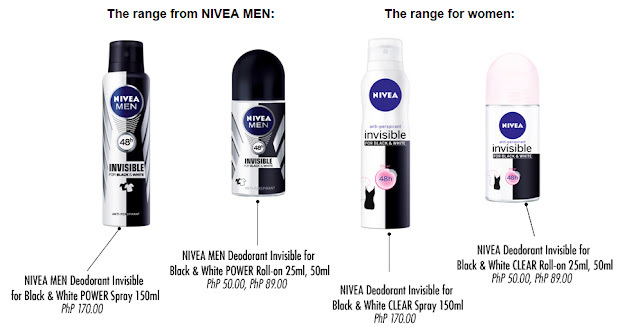 NIVEA Deodorant Invisible for Black & White is now available in stores nationwide! 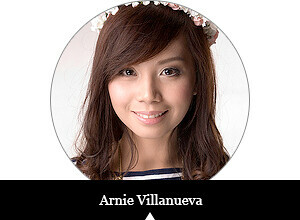 Visit www.NIVEA.ph and like their Facebook page for more information and updates.